I thought it would be fun this year to let my 7 yr old son design his own costume. 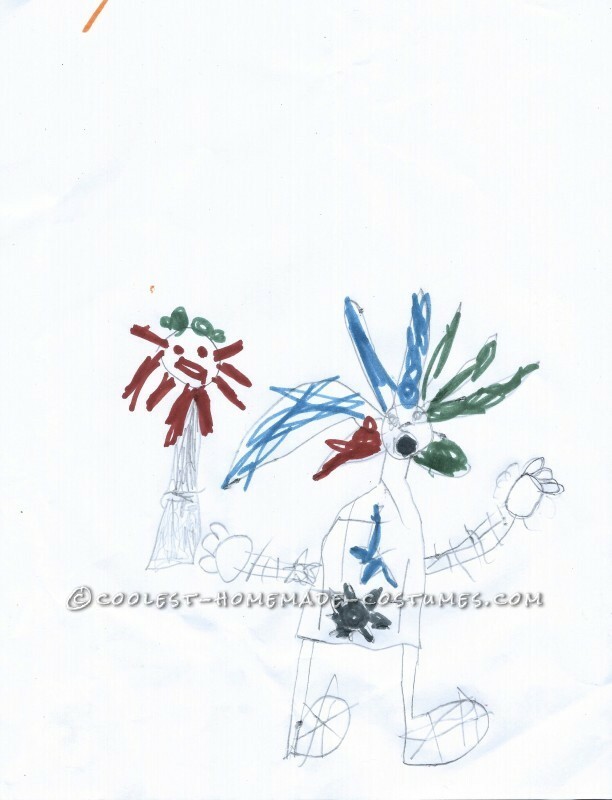 So he was excited to draw up his idea and came up with this crazy spikey haired clown guy with a tie. It was very fun to make his vision come to life. 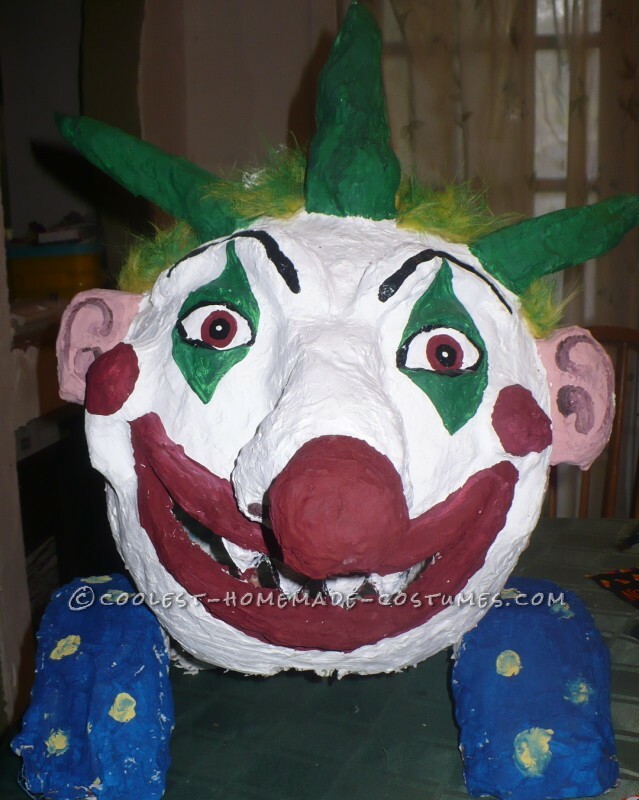 I decided to make a crazy big clown head out of plaster. 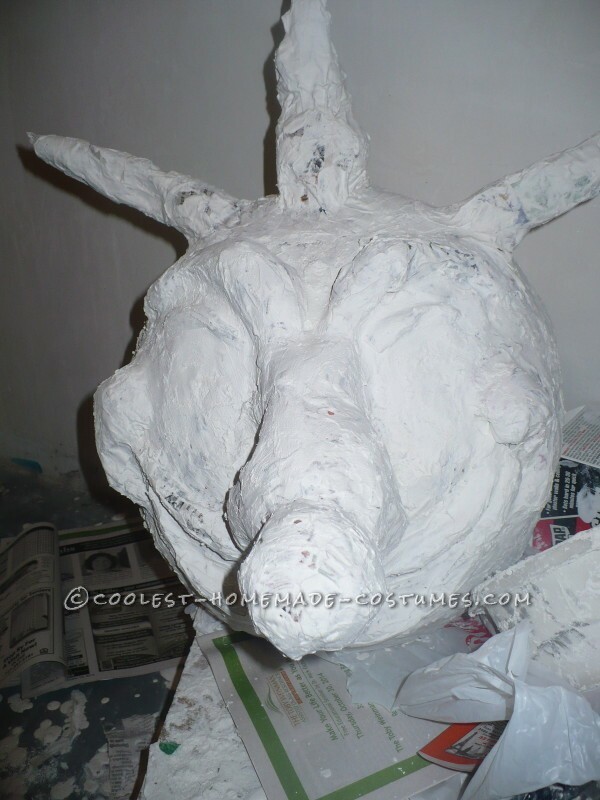 I started with a large punch balloon and coated it with newspaper strips dipped in plaster of Paris. I did several coats and then added the features which were made up of more newspaper crumbled into shapes. Once I got all the features on and as smooth as possible, I started on the really exciting part- the paint job! I used Acrylic paints and went for a classic white clown face, red nose, red cheeks and some green around the eyes. My son wanted red eyes so that’s what I did. After all the paint was done, I cut out a hole in the mouth for my son to see out of. Then I cut a large hole for his head to go through. The head ended up being so heavy since I used plaster instead of paper mache; I had to then go ahead and add shoulder supports. I made those out of more newspaper, wire and plaster. The shoulder supports definitely helped, but the head was still very heavy to wear and he couldn’t wear it for long periods. My husband carried it door to door and he put it on once we got to each door stop. The people really got a kick out of it and couldn’t believe I made it. 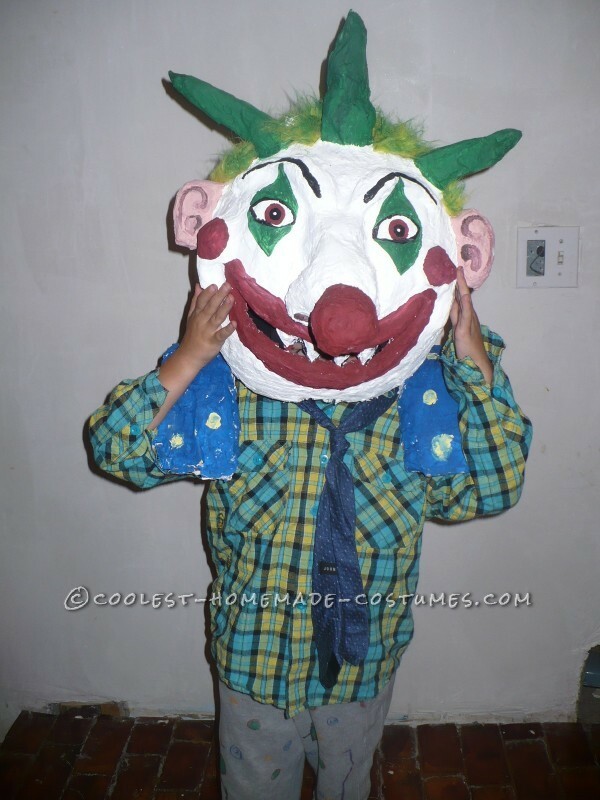 A lot of people thought it was pretty creepy too, but aren’t ALL clowns creepy? All in all it was a great night of trick or treating! This is a picture of the head in progress. Plaster features added and almost ready for paint! I painted the head and then added some yellow fake fur for hair which I painted green. Clown head is done and ready to wear!